Wood was probably the first material used by humans to construct a bridge. Of the bridges in the United States with spans longer than 20 feet, approximately 12 percent of them (or 71,200 bridges) are made of timber. Today, Milbocker & Sons, Inc. modern technology and advanced construction techniques are making timber bridges stronger, more durable, maintenance-free and environmentally friendly than ever before. 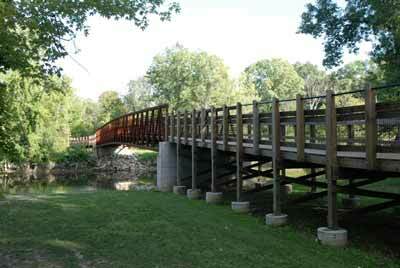 Timber's strength, light weight, and energy-absorbing properties make it highly desirable for bridge construction. Timber can meet the same structural requirements as any other building material, this means that Milbocker & Sons, Inc. professionally built timber bridges are suitable for pedestrian and vehicular traffic. Properly treated timber will not crumble like concrete, will not rust like steel and can be used in any environment regardless of climate. Wood is not damaged by continuous freezing and thawing and resists harmful effects of de-icing agents, which cause deterioration in other bridge materials. Design constraints of using steel or concrete will slow down the installation process, whereas timber is a readily available resource and installation will not delay your project. For more information on Milbocker & Sons, Inc. professional timber bridge construction, or to request a quote, contact us here or call us directly at (269) 673-2195.